ONE: Combine one teaspoon of each jojoba bead color in a container and mix well. Set aside. TWO: Cut 9.5 oz. Goat Milk Melt and Pour into small cubes. In a heat safe container, melt the soap on 10 second bursts, stirring between each burst. THREE: Shave or cut a very small amount of the Yellow Oxide Color Block and add to the melt and pour. We cut a small corner chunk of the color block, but you can add small amounts until desired color is reached (a little goes a long way). Stir well to combine. FOUR: Add 3 mL of Vanilla Select Fragrance Oil and 3 mL of Vanilla Color Stabilizer. The Vanilla Color Stabilizer will prevent the Vanilla Select Fragrance Oil from discoloring the soap. Stir well to incorporate. FIVE: Pour melt and pour into the mold, and spray with 99% isopropyl alcohol to disperse bubbles. Keep about .5 ounce for step 7. SIX: Allow the doughnuts to dry for 30 – 60 minutes until firm. Remove from the mold. SEVEN: Remember that .5 oz. of base you saved from step five? Re-melt it and place a small amount on the flat side of a doughnut. Place another half-doughnut on top, and press down gently. Repeat this process until you have “glued” six doughnut halves together to make three complete doughnuts. EIGHT: Cut 2 oz. Goat Milk Melt and Pour into small cubes. In a heat safe container, melt the soap on 5 second bursts, stirring between each burst. Add small amounts of the Fired Up Fuschia Color Block until you obtain a soft pink color. This is a very strong color so use it sparingly! NINE: Add 3 mL Strawberry Fragrance Oil and stir to combine. Let the soap cool to 120 degrees or below. TEN: Lay down a sheet of parchment paper or place your doughnut on a surface that you don’t mind getting some melt and pour on. 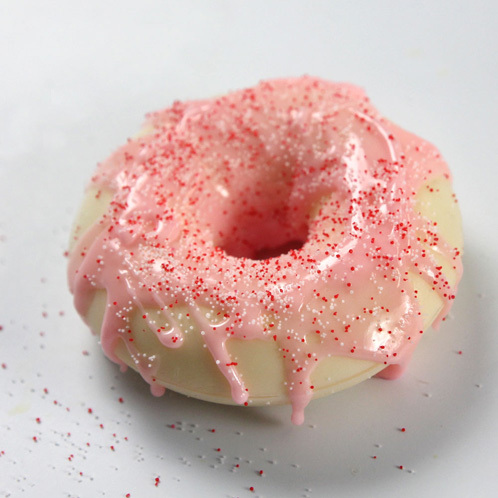 Using a spoon, drizzle about a third of the pink soap onto the doughnut until completely covered. The melt and pour will dribble down the side and into the center of the doughnut to form the frosting. ELEVEN: While the pink soap is still liquid, sprinkle a pinch of Jojoba Beads on the top. When dry, you may need to wedge a spatula underneath the doughnut because the frosting may have adhered it to your table surface or parchment paper. TWELVE: Repeat this process with the two remaining dougnuts. Let cool for another 30 – 60 minutes and enjoy! Combine one teaspoon of each jojoba bead color in a container and mix well. Set aside. Cut 9.5 oz. Goat Milk Melt and Pour into small cubes. In a heat safe container, melt the soap on 10 second bursts, stirring between each burst. Shave or cut a very small amount of the Yellow Oxide Color Block and add to the melt and pour. We cut a small corner chunk of the color block, but you can add small amounts until desired color is reached (a little goes a long way). Stir well to combine. Add 3 mL of Vanilla Select Fragrance Oil and 3 mL of Vanilla Color Stabilizer. The Vanilla Color Stabilizer will prevent the Vanilla Select Fragrance Oil from discoloring the soap. Stir well to incorporate. Pour melt and pour into the mold, and spray with 99% isopropyl alcohol to disperse bubbles. Keep about .5 ounce for step 7. Allow the doughnuts to dry for 30 – 60 minutes until firm. Remove from the mold. Remember that .5 oz. of base you saved from step five? Re-melt it and place a small amount on the flat side of a doughnut. Place another half-doughnut on top, and press down gently. Repeat this process until you have “glued” six doughnut halves together to make three complete doughnuts. Cut 2 oz. Goat Milk Melt and Pour into small cubes. In a heat safe container, melt the soap on 5 second bursts, stirring between each burst. Add small amounts of the Fired Up Fuchsia Color Block until you obtain a soft pink color. This is a very strong color so use it sparingly! Add 3 mL Strawberry Fragrance Oil and stir to combine. Let the soap cool to 120 degrees or below. Lay down a sheet of parchment paper or place your doughnut on a surface that you don’t mind getting some melt and pour on. 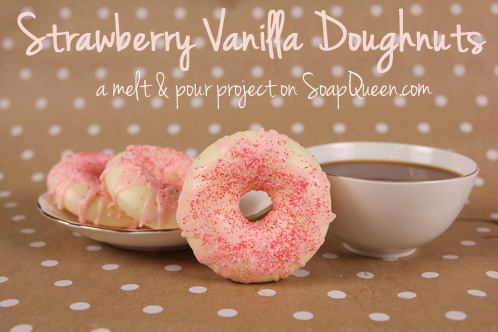 Using a spoon, drizzle about a third of the pink soap onto the doughnut until completely covered. The melt and pour will dribble down the side and into the center of the doughnut to form the frosting. While the pink soap is still liquid, sprinkle a pinch of Jojoba Beads on the top. When dry, you may need to wedge a spatula underneath the doughnut because the frosting may have adhered it to your table surface or parchment paper. Repeat this process with the two remaining dougnuts. Let cool for another 30 – 60 minutes and enjoy! I’ve tried the doughnuts everything was easy until I’ve tried them the second time the two halfes detached :(. I do something wrong ? Oh no, I’m sorry those halves detached! We found the doughnut halves stick really well when they are allowed to cool and harden for 30-60 minutes, or up to 2-3 hours. So, it may be that your doughnuts just need a bit more time to harden! Thank you for this great project. These were a hit among some friends and we just received a request to make another home and school donation basket. We seem to have developed a fruit fly problem since we last ordered supplies and soaped. Is this a common occurrence with sweet smelling FO.? This is so fabulous.I am a GM for the donut shop that America runs on and the possibilities are endless with this mold.I am so flippin excited to create some calorie free donuts with these molds. I have been making the donut soaps for a few months now and they are always a hit. 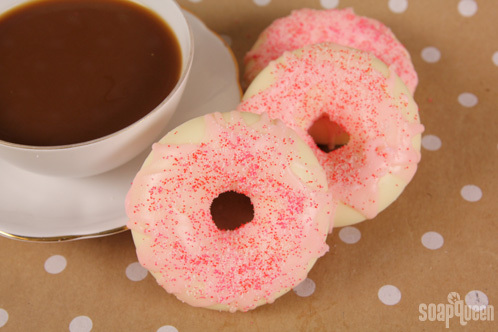 I would just make one suggestion, instead of dumping the “frosting” on top, put it in a shallow bowl and dip the donut instead, it allows it to have a full even coating and drips just enough down the sides for a more “cartoon like” effect. Of course it’s up to the creator to decide how their pastry is frosted, but this way is really fast and less messy! I’m glad you liked this recipe! I cannot to get the add to cart button to work. The click here doesn’t work either, all I get is an empty cart. Oh I’m sorry the button doesn’t seem to be working for you! I checked it, and it seems to be working now :). Let me know if you are still having problems with it! Oh shoot, thanks for letting us know. It’s an issue we are trying to get resolved. I’m glad you’ve been able to make some progress with your goal, that’s awesome!